The Discovery Channel has produced numerous interesting shows about dinosaurs. Their Web site has three-dimensional views from these shows, an interactive tour, and animations. Philadelphia’s Academy of Natural Sciences has a variety of dinosaur fossils in its Hall, including theropods, ceratopsians, and hadrosaurs; there is also the Big Dig, a replica of the New Mexico Badlands where dinosaur hunters can dig for fossils. Their Web site has information about all these attractions, as well as the fossil prep lab. 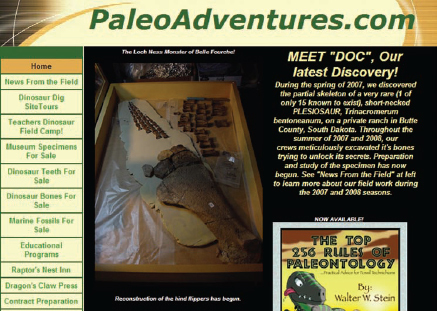 There are many fascinating and informative Web sites available on the Internet, such as Paleo Adventure, a site that actually helps people arrange dig site tours, camping trips, and more.